Made of a mixture of black embossed polypropylene and polyethylene which gives it high strength and allows it to float. Also treated with a UV stabilizer to help protect the rope from UV damage. 20mm, (3/4") black magic, 24mm, (7/8") black magic, 28mm, (1 1/8") black magic, 32mm, (1 ¼") black magic, 24mm, (7/8") AquaSteel, 28mm, (1 1/8") AquaSteel, 32mm (1 ¼"), AquaSteel, 36mm, (1 7/16") AquaSteel 40mm, (1 9/16") AquaSteel, length 220m, (722'). 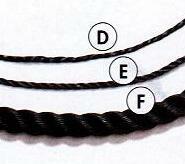 Manline rope is generally used as the longline of the both the continuous and single dropper growout methods. The mainline rope is attached to the anchor lines of the system, mussel lashing is used to tie the cultue ropes and buoys to the mainline. Has high abrasion resistance (both internal and external) which is important because as the buoys move up and down on the water, the mainline bends and flexes. Its material of black embossed polypropylene and polyethylene gives it high strength and allows it to float. It is treated with a UV stabilizer to help protect the rope from light damage. AquaSteel is made from high tenacity polypropylene/polyethylene mix.